Grass should be mowed at a height of 2½ to 3 inches. This is likely the highest setting on your lawn mower. Grass cut at this height will have plenty of grass blade to absorb the sun’s energy and still retain moisture. It is also a good height for root development and for crowding out weeds. Try to never cut more than 1/3 of the grass blade at once. This means that ideally you are never cutting more than one inch of grass at a time. Sharp blades make a clean cut on the grass blade that will heals quickly. A dull blade will leave a ragged and torn rip that will leave the grass blade susceptible to disease, the tips will turn brown and excessive moisture will be lost from the grass plant. When you mow the lawn, do so often enough that you will not be removing more than an inch or so. 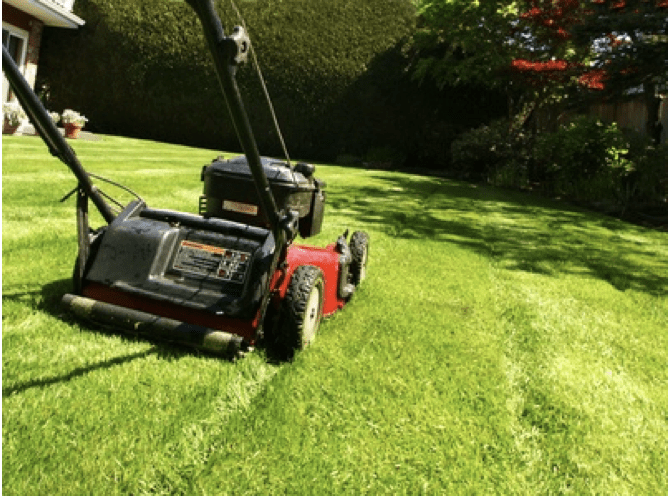 By doing this, your lawn mower should be able to effectively mulch the grass clippings back into your lawn with out leaving clumps of grass behind. Mowing when the lawn is dry will also help significantly with unwanted grass clumps. If your lawn mower is leaving clumps behind, make sure the under side of your mower deck is clean. If it is clean, your blades are sharp and it is still leaving clumps behind, you can easily and quickly scatter those clumps with a leaf blower, or a simple quick drag of your foot through the clump, or with a rake. Mulching recycles valuable nutrients and organic matter back into the lawn. A lawn that has its clippings regularly mulched will break down thatch quicker, will be less inviting to harmful insects, will require less watering, and will require less fertilizer to stay green. The only times where bagging should be done is the first cut or two in the spring, the last cut or two in the fall to help pick up fallen leaves, or when you come back from vacation and your lawn is a jungle. Lawns should be cut when they have grown about an inch more than the last time you cut it. In the spring and fall when the temperature are cooler grass grows quicker and therefore you may need to mow your lawn every 4 or 5 days. In the heat of the summer mowing may only need to be done every 10 to 14 days. The best time of day to cut your lawn is in the evening a few hours before the sun goes down. This gives the lawn a chance to heal during the cooler temperatures of night. Watering should be done early in the day about the time the sun is coming up. Typically it is less windy then. It is also cooler and more water will get absorbed into the ground and grass plant before evaporation. Watering should be avoided in the evening as leaving the lawn moist all night can promote disease and fungal issues. In order for a lawn to stay green all summer long it needs about two inches of water per week. That fluctuates depending on how hot or windy it is, or cool and calm it is. 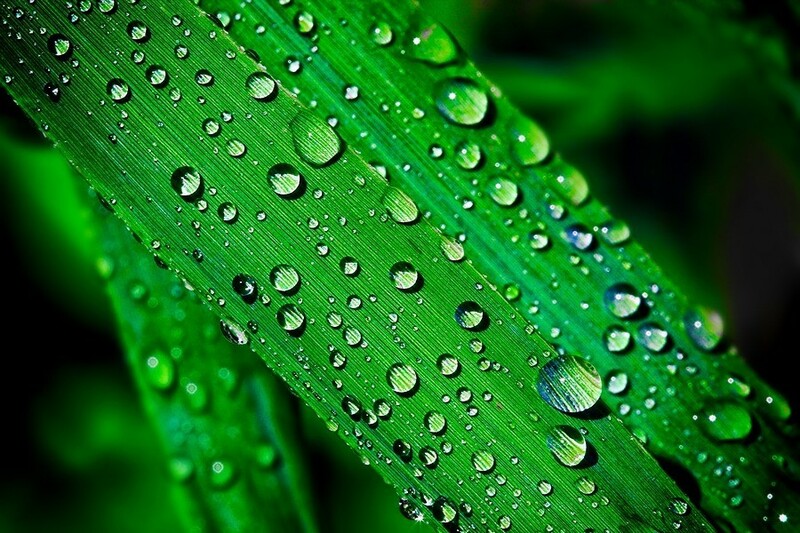 In theory, two deep watering of an inch each time should keep your lawn healthy and lush. Here are some other factors to keep in mind, what type of soil do you have, is your lawn on a slope, do you have huge trees on your property, how about the lawn along side your hot concrete driveway. The theory of watering 1 inch of water twice a week is really a rule of thumb. You need to learn what your lawn’s watering needs are and adapt. If you notice that after watering for five minutes in your front lawn, all your water is running off onto the sidewalk and down the street it doesn’t make much sense to do long deep watering cycles. In this case maybe water for five minutes in that area and coming back to it an hour later and water it again for five more minutes (automatic sprinklers are really nice for these kind of scenarios).